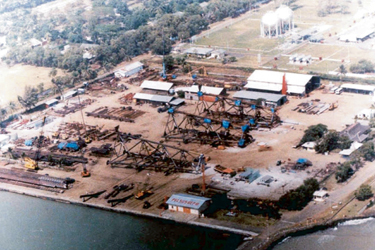 The three tripods are to be installed into the East Stupa, West Stupa and East Manda oil fields. 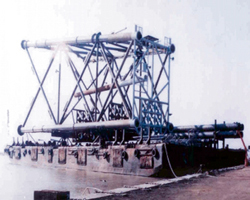 Through the 14 kilometers of 24-inch and 12-inch interpolator pipelines the tripods will be linked. 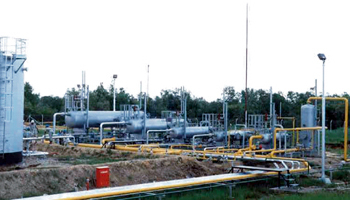 A 24-inch, 80-kilometre pipeline will export the outputs from the three fields. 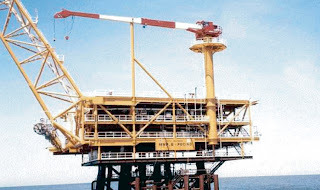 The fabrication and installation job is likely to occur from 2010 resulting the production start-up in 2011 or 2012. 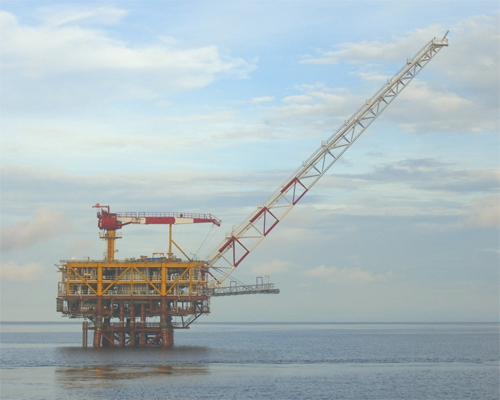 The South Mahakam development is expected to yield 14,700 barrels per day of liquids and 114 million cubic feet per day of gas. 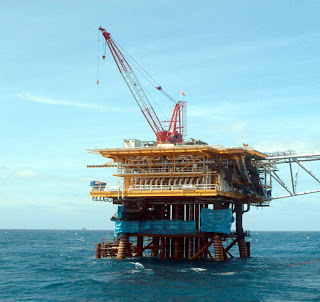 North Belut Field, Natuna Sea, Indonesia. Wellhead Platform D: A four (4) legged jacket to be installed in water depth of approximately 96.9 m.
Deck weight 2,014 MT & Jacket weight 1,943 MT. 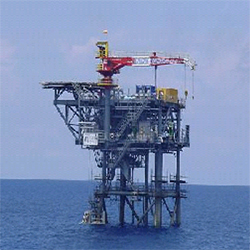 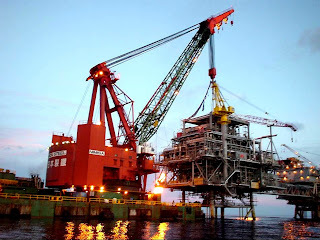 Wellhead Platform C: A four (4) legged jacket to be installed in water depth of approximately 96.2 m.
Peciko Phase 5 Project (TOTAL E&P Indonesie) ~ EPCI of one (1) Platform Peciko Field, East Kalimantan, Indonesia. 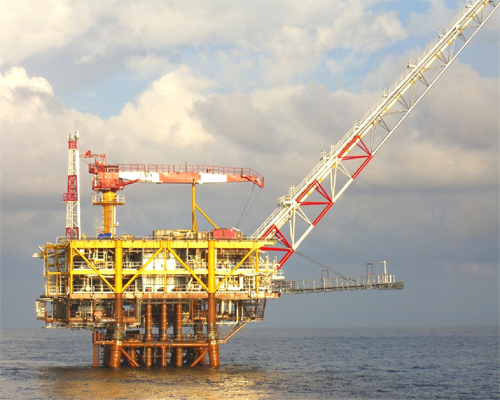 SWP-F Platform: A four (4) legged jacket to be installed in water depth of approximately 50 m.
Deck weight 1,045 MT & Jacket weight 854 MT. 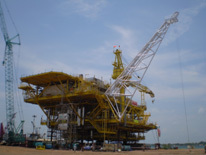 Sisi and Nubi Field, East Kalimantan, Indonesia. 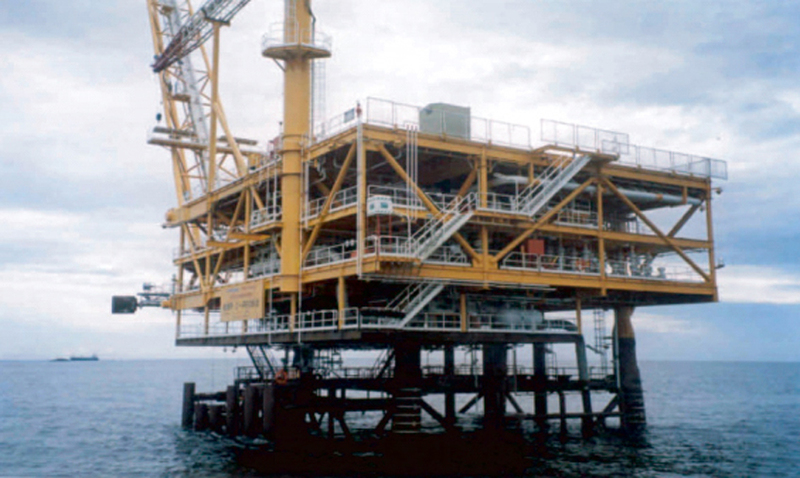 MWPN Platform: A four (4) legged jacket to be installed in water depth of approximately 69 m.
Deck weight 1,220 MT & Jacket weight 1,260 MT. 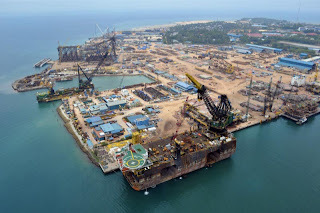 MWPS Platform: A eight (8) legged jacket to be installed in water depth of approximately 79.7 m.
Deck weight 1,090 MT & Jacket weight 1,050 MT. 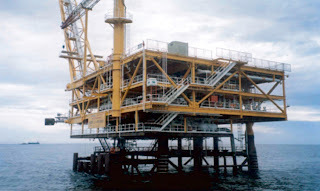 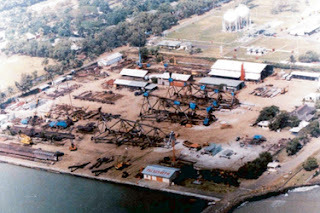 WPN2 Platform: A four (4) legged jacket to be installed in water depth of approximately 62.7m. 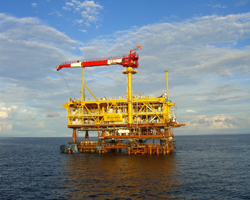 Deck weight 1,910 MT & Jacket weight 2,625 MT. WLWP Platform: A four (4) legged jacket to be installed in water depth of approximately 75.5 m.
Deck weight 701 MT & Jacket weight 1,052 MT. 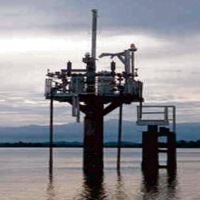 Yadana Project (TOTAL E&P Myanmar). 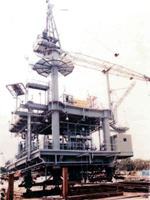 Yadana Platform: A four (4) legged jacket to be installed in water depth of approximately 50.10 m.
Deck weight 274 MT & Jacket weight 667 MT. 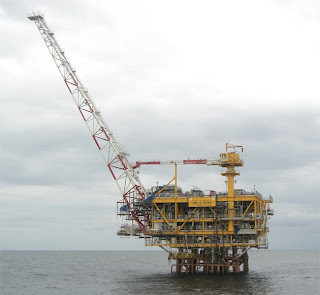 WP14 Platform: A four (4) legged jacket to be installed in water depth of approximately 77 m.
Peciko Field, East Kalimantan, Indonesia. MWPA Platform: A four (4) legged jacket to be installed in water depth of approximately 44.8 m.
Deck weight 1,305 MT & Jacket weight 816 MT. MWPB Platform: A four (4) legged jacket to be installed in water depth of approximately 42.6 m.
Deck weight 1,309 MT & Jacket weight 802 MT. MWPC Platform: A four (4) legged jacket to be installed in water depth of approximately 40 m.
Deck weight 1,540 MT & Jacket weight 773 MT. 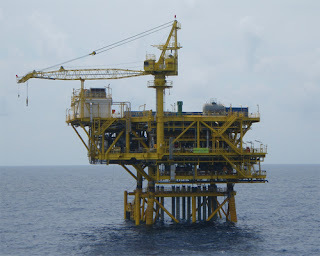 Japex Field, North Sumatra, Indonesia. Arco Field, Java Sea, Indonesia.